The clocks have gone back we have colder evenings and winter is definitely here! These reasons are enough to put the outdoors on the back burner until next spring. However, we at Rent An Irish Cottage know it can be a wonderful time of year to get outside and enjoy fresh air and great walking trails Ireland has to offer. Refreshing country walks this time of year have bonuses – lack of summer crowds, ease of parking and peaceful sunsets in magical locations. And the light is different making for amazing winter sunshine photographs. There are nifty apps out there to help you plan a perfect day out. Rent An Irish Cottage has used and tested some (not all) on walks and we highly recommend doing some reading before you explore! We list some good ones at the end. 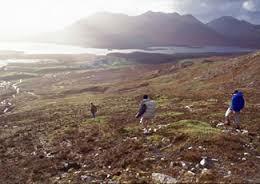 Moving further north the Beara Penninsula offers the outdoors inclined a variety of difficult to easy walking trails. Just outside of Kenmare and the old Kenmare road there is so much choice from an easy 1 hour walk to a more difficult 5 hour trek on the Sneem Way. Kerry is also popular with walkers during the winter and many people take weekend breaks to go walking during morning and early afternoon hours. Torc Waterfall and Killarney are more popular with locals during the winter for the peacefulness Killarney National Park offers the visitor. Clare can be delightful in the cooler months, Kilkee has especially beautiful short walks under two hours that seem to be perfect in crisp weather. One can visit The Pantry Café afterwards and enjoy a hot chocolate and snack! The Burren has many walking clubs to join in with on the weekends as well as a guided tour guides who enjoy showing the splendor of The Burren to visitors at any time of year. The Ballyvaughan Fanore walking club hosts many outings and are worth contacting if you are visiting The Burren with Rent An Irish Cottage. Other popular walking along the coast include north Clare, Galway especially in the charming hamlets and beaches around Clifden. Connemara National Park is open year round and guides are also available to take the visitor on tours. Another area that is more popular during the winter is Achill Island, the New Years Day swim attracts visitors for the holidays for the natural beauty, stunning sunsets and lively music and good food in warm pubs throughout the island. Our best advice for winter walks and hikes is take a charged phone, a flash light, warm clothes and extra socks for damp feet and of course appropriate outerwear.